Per Hard Disk SATA da 2,5". E' sufficiente installare un normalissimo hard disk da 2,5" SATA (lo stesso impiegato nei computer portatili) all'interno del box e collegare quest'ultimo alla porta USB tramite il cavo fornito. Docking Station è un centro di controllo esterno per pc e per avere tutto a portata di mano. Infatti è possibile collegare qualsiasi Hard Disk SATA o IDE, sia esso da 2,5" che da 3,5". Il tutto con la velocità di un collegamento al PC tramite USB 2.0. L'utilizzo è semplice ed intuitivo: basta collegare la HDD Docking Station ad una porta USB 2.0 del proprio computer per essere già operativi. L'Hard Disk va inserito nella Docking Station ed in pochi secondi verrà aggiunto alle risorse del computer. In questo modo, il backup o il trasferimento dati potrà essere immediatamente attivato. Box esterno USB per collegare hard disk al computer in modo semplice e veloce. BOX HARD DISK 3.5 SATA. 1 Box in alluminio. 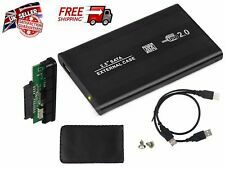 Box esterno usb 2.0 per hard disk IDE e sata da 2,5 pollici. 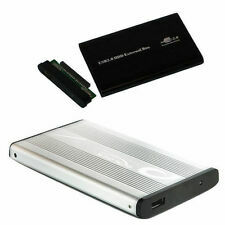 Box esterno portatile USB 2.0 per Hard Disk IDE e SATA da 2,5 pollici. Doppio adattatore per IDE o per SATA! Attacco per Hard Disk (non incluso) da 2,5 pollici IDE. 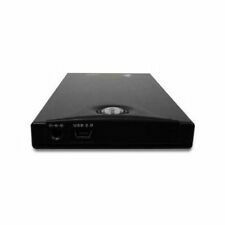 BOX CASE USB SLIM ESTERNO PER HARD DISK 2,5" CON ATTACCO IDE. Dischi rigidi supportati: disco rigido da 2.5" IDE. Compatibile con HD IDE da 2.5" di capienza da 10Gb a 250Gb. 1 connettore IDE. 1 Box esterno per HD. It is Compatible with SSD Hard Disk, Which Has a 22mm x 30mm/42mm/60mm/80mm NGFF(M.2) Interface. 1 x USB 3.0 to NGFF SSD Case. Assembly: By Screws, suitable for all SSD Hard Disk. 1 x USB 3.0 Male to USB 3.0 Super Speed Micro-Bx. (Note: Using the USB port to sync requires plugging the included USB cable into your Mac—more on that later.). The left side of the drive is blank, but there's plenty of action on the back: There are no extra-fast USB 3.0 ports to be found, but there is a USB Type B port to connect to your Mac, two regular USB 2.0 ports acting as a USB hub, and two FireWire 800 ports. Boitier Disque Dur 2.5" IDE. pour disque dur IDE de 10 à 500GO. plug&play, branchez le au pc sans CD. incluts : 1 boitier 2 vis tournevis 1 câble USB 1 pochette simili. 100% Brand New,Plug and PlayFull compatible with USB 2.0/USB 1.1Power by USB, no external AC adapter neededSupport all SATA Optical Drive/Burner with 12.7mm height.Compatible with Windows 98/SE/ME/2000/XP/vista /windows 7, NOT work with MAC osColor: BlackDimensions:5.2"(W) x 0.8"(H) x 5.5"(D)Weight: 80gSystem Requirements : Windows 98SE/ME/2000/XP/vista/windows 7Warranty: One Year Note: NOT AN External DVD Dirve USB2.0 Enclosure only.Can NOT Read/Burn Any Disc Without the SATA Drive/Burner. No IDE Drive/Burner is NOT included.Package content:1 Pcs USB Enclosour/Candy1 Pcs USB to Sata PC board1 Pcs USB Data Cable1 PCS USB Power Cable1 Pcs Case2 Pcs Screws1 Pcs English manualNo DVD drive included, case/caddy onlyNote: Light shooting and different displays may c.
Aluminum alloy metal, super shock. 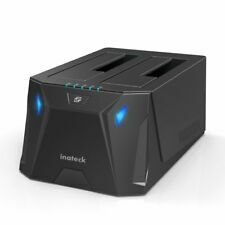 Supports USB 2.0 interface, the maximum support capacity 500GB Super slim and easy protability. Plug-ins to use, hot swappable, easy to install. External power supply. Size: compliant with 3.5 inch IDE hard-disk. Color: Sliver. Net Weight:558g Package included:1 x 3.5 inches IDE Hard-disk Cartridge Case 1 x HDD power supply 1 x power cord Note: Light shooting and different displays may cause the color of the item in the picture a little different from the real thing. The measurement allowed error is /- 1-3cm. Brand Unbranded MPN Does not apply UPC 191466229958 EAN 191466229958 ISBN 191466229958 UPC 191466229958 EAN 191466229958 ISBN 191466229958. Can't Find Your Hard Disk in Windows?. UASP enclosure, 20% faster than traditional USB 3.0, lower CPU utilization. To change the drive letter, select "Change". To add a drive letter, select "Add". Ultra-thin, portable. 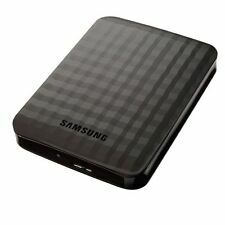 Fits most 2.5" Portable Hard Drives, Compatible with 80GB-1TB 2.5" External Hard drives. Adjustable strap within case secures portable Hard Drive. Lightweight Moulded case. Closed by 2 way zipper. All enquiries will be responded to within 24 hours. 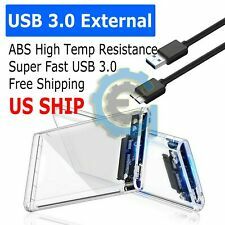 This is a 2.5" SATA HDD Enclosure Case compatible with USB 3.0 SATA HDD Enclosure,helps you to transfer data quickly and conveniently.USB 3.0 with 5Gbps data transfer rate, 10x faster than USB 2.0; Compliant backwards with USB 2.0 standards.Support 2.5" SATA hard disk drive; Directly powered via USB port, no external power required; Easy to data backup and exchange.Compatible for PC, notebook and Mac OS computers,No software and driver needed (except for Windows98SE) .Excellent heat released function, good protection design for hard disk.Interface Type: USB 3.0Compatibility: Win98/98SE/ME/2000/XP/Vista/7/Mac OS 8.6 or laterDimension: 4.96" L x 2.95" W x 0.51" H(126mm x 75mm x 13mm)USB Cable Length: 45cmColor: BlackMaterial: Aluminum alloyApplicable Hard Driv. 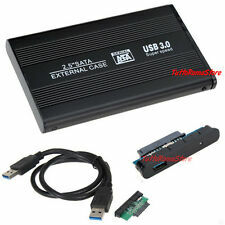 2.5 SATA TO USB HARD DRIVE CADDY HDD ENCLOSURE CASE. 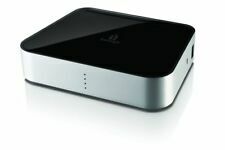 It supports 2.5" SATA Hard Drives any speed up to 120GB Thickness 9.5mm. PC & Laptop Accessories. Hot swap and Plug & Play technology. 2.5" SATA Hard Drive Enclosure. This is only CD DVD RW Case Cover. It doesn't include any CD or DVD RW. High Quality SATA to USB External Enclosure Case. 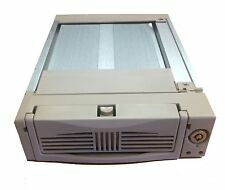 SATA Laptop CD/DVD ROM External Enclosure case. Supported Drives: DVD R, DVD RW, DVD-ROM, DVD-RW. Akitio Thunder2 PCIe Expansion Box. Replacing the card is a simple matter of removing three hand tightening screws, so no tools are required. 1 PCIe (x16) slot supporting half-length, full-height, double-width cards. Suitable for 3.5" SATA hard drive. Note: Light shooting and different displays may cause the color of the item in the picture a little different from the real thing. Fits all 3.5" Serial ATA hard drives.Hot Swappable.Stylish front panel design with excellent ventilation.4 sets of Anti-Vibration rubber foot stand.Colour: BlackSATA II 3.0Gb/s High Speed Transfer. Working W/O any Driver of Software. Tool Free Hard Disk Installation. Security Key Lock (and 2 Spare Keys Included). Tool-Free front door design. Easy hard disk slide in/out. Support Windows 2000/2003/XP. High quality warranted. Min. Hardware requirement: M/B Southbridge chip version: ICH7 or above One S-ATA (15pin) power cable One S-ATA (7pin) data cable Interface: Standard S-ATA Rack material: Aulminum Product size: 175 x 147 x 48mm Product weight: 307g Package Included:1 x SATA HDD-ROM (7 15pin S-ATA cable) 4 x Screw 2 x Keys 1 x English ManualNote:Light shoo. 100% Brand new and high qualityThe Slim USB external Case/Caddy fit for all 9.5mm Height SATA (Serial ATA) Laptop Tray loading DriveSATA(6PIN 7PIN) Connector Compatible with 9.5mm SATA Interface internal optical drives (CD-Rom / CD-RW / Combo / DVD-Rom / DVD-RW /- / Lightscribe / blu-ray drives)Plug & play .no need any power adapter, USB power directly. No driver required. Simple installation. Just plug it in and ready to goSupport USB2.0 (480Mb/sec), fully compatible with USB1.1 (12Mb/sec). Compatible with All USB PortSystem Requirements : Windows 98SE / ME / 2000 / XP/ vista / Mac OS 9.22 / Linux 2.4 or higherSize : 138 x 138 x 18mmWeight: 175gColor: BlackEasy and Convenient to use.Quantity: 1pcsPackage Include: 1 x USB Enclosure / Caddy (Without retailing. It support 3.5" SATA I-II Hard Drives any speed up to 2000GB (2TB). 3.5 SATA to USB 2.0 External Aluminium Enclosure Caddy. With Built-in Fan to protect the Hard Disk Drive from getting Hot, which help Hard Drive to work Fast and have longer Life. 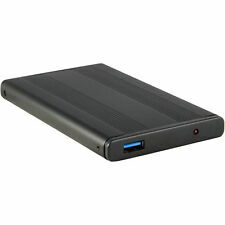 100% Brand New, Plug and Play.Full compatible with USB 2.0 / USB 1.1.Power by USB, no external AC adapter needed.Support all IDE Optical Drive/Burner with 12.7mm height.Compatible Driver Connector: 50-pin standard Laptop Drive (IDE/ATAPI)Color: Black .Dimensions: 5.2"(W) x 0.8"(H) x 5.5"(D).Weight: 11 ozCompatiblility: Windows 98SE / ME / 2000 / XP/ vista /windows 7Packager content :1 x USB Enclosour/ Candy1 x PC / Electronical BoardNote: Light shooting and different displays may cause the color of the item in the picture a little different from the real thing. The measurement allowed error is /- 1-3cm. Brand Unbranded MPN Does not apply UPC 191466231500 EAN 191466231500 ISBN 191466231500. The product has Micro USB 3.0 interface, supporting Plug & Play and Hot-Swapping. Interface: Micro USB 3.0 ; Support current: 3A (Max.). This product supports the SSD from computer models 1x USB 3.0 to 2013 2014 2015 2016 2017 SSD Adapter Case Enclosure. Product type: HDD Enclosures. Human nature design, easy installation. Tool free. Super slim and easy portability. The maximum support capacity 3TB. Supports Windows 7 / 8 / 10. Akitio Node Lite - Thunderbolt 3 PCIe Expansion Box. The Thunderbolt 3 (USB-C) connection not only makes adding an external PCIe card easy but it also allows you to take the device with you to use on location and move it from one system to another. Supports 2TB over HDD. Integrates a high speed encryption HW:AES Super speed. 2.5 SUPER SPEED ENCLOSURES. Supports ATA command pass though function. Mass storage class bulk. Supports change andresponse authentication. 9.5mm SATA to SATA HDD hard disk drive caddy adapter. 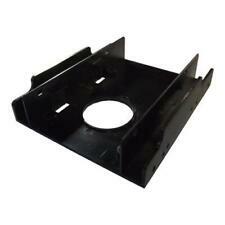 SATA 9.5mm Hard Disk Drive Caddy Adapter Tray. HDD Interface: SATA. Insert the hard drive into the hard drive caddy. SATA interface. Fast and easy connection. Tool-free Installation, Hot-Swappable Hard Disk Drive Enclosure-Easy Plug and Play. Supports Standard Notebook 2.5″ SATA Hard Drives and SSD Drives. We do not accept any liability for any data loss claim. You will agree to take full responsibility for files and data transferred when putting your HDD via this USB Case. Support 2.5" SATA HDD less than 9.5mm thick (if you need to put it into this case). 2.5" SATA HDD Enclosure - eSata External Sata Interface. 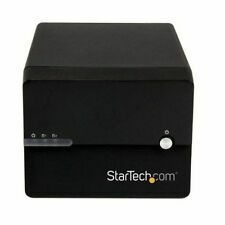 USB 2.0/eSATA hard drive enclosure for use with 2.5" SATA hard drives. eSATA compliant (up to 3GB transfer speeds). End 1: USB Type A Socket eSATA Socket. High speed USB 2.0 and eSATA interfaces. - External alternative to installing hard drives. Quickly connect and disconnect different drives without the hassle of installing them into external housings or opening up a computer case. A simple protection with a great effect. The enclosure features two cushions at the top and bottom to dampen the direct shock to the hard drive. Anti-Liquid Splash Material protects your drive from accidental spills and storing your drive in the HDD protection case gives it a dust-free shelter. CHIPAL Universal SATA 3.0 Second 2nd HDD Caddy 9.5mm for 2.5" 9mm 7mm SSD Case Hard Disk Enclosure for Laptop DVD-ROM CD-ROM. 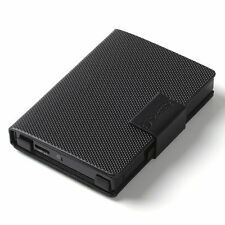 The 2nd Hard Disk Drive Caddy / Adapter to bring you new maximum data storage flexibility. Fenlink 2.5" to 3.5" SATA Drive Converter - New!